When photographer Kenny Loh published Born In Malaysia last year, it was a culmination of three years’ worth of work documenting what is arguably a superb chronicle of the vast cultural diversity that has made this nation the envy of many. The attention and traction the book has received since then, however, is something even Kenny never expected. Among other recognitions, the book was one of the Anugerah Buku Negara recipients late last year, presented by Yayasan Pembangunan Buku Negara (National Book Development Foundation). Artemis Art got to see the completed book earlier this year. 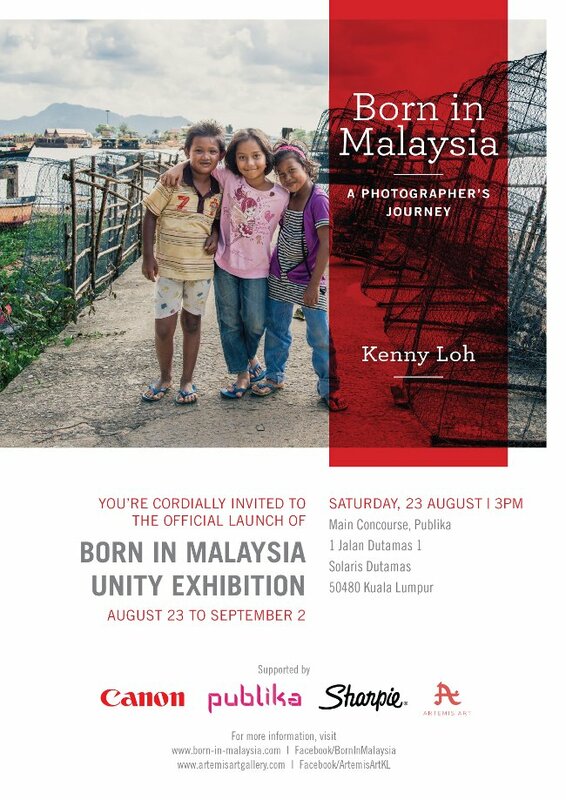 We had known about Kenny Loh and his Born In Malaysia book project as early as 2012 when the gallery first started. But it was only after the book’s publication that we really saw the full impact of what Kenny had accomplished. And we saw something else, as well. If you’ve read Born In Malaysia you’ll agree that the book succinctly captures the essence of what this nation is about. Her rich diversity has been superbly captured in the images and stories contained within the book. What we also realized was that despite this nation’s vast diversity, another important commonality emerged – a very strong sense of belonging to this great nation. The “Born In Malaysia Unity Exhibition” is aimed at fostering greater national unity through the promotion of two key ideas. First, that Malaysia’s cultural and social diversity is not a hindrance to national unity. We believe what makes this nation great is, in fact, her very rich diversity. Secondly, it is the notion that the true basis of national unity is a strong sense of belonging. Both ideas are superbly captured by the book, which made itÂ the natural source material for the exhibition. We think that no other book in recent memory has done quite as good a job as Born In Malaysia has in terms of promoting national unity. The Born In Malaysia Unity Exhibition is scheduled to run for 10 days from August 23 until September 2, at the Main Concourse (Level G2), Publika Shopping Gallery, Solaris Dutamas, Kuala Lumpur. The official launch will be held at 3pm on Saturday, August 23, 2014. Joining us for the launch will be representatives of Malaysians For Malaysia (M4M), an informal group of concerned citizens that has successfully organized events aimed at bringing together Malaysians of all cultures and faiths. In addition to the storyboards, selected prints from the original book, plus several new images inspired by it, will be on display at Artemis Art’s pop-up gallery, located at Lot 48, adjacent to where the main exhibition will be. Two audience-interactive boards will also be set up as part of the exhibition. One is a Unity Wall, on which visitors to the exhibition can write, in their own words, what “Unity” means to them. The other will be a Photo Scrapbook WallÂ on which visitors are encouraged to post their own photos depicting what being Malaysian is all about. On the exhibition launch day, Canon Malaysia will be on hand to print these images for the visitors. The launch will also be your opportunity to meet with a few individuals featured in the book, including a group of children from Tras, a village in Pahang the majority of whose residents are Temuan. They will share insights about their stories as depicted in the book, as well as share what it means for them to be a proud citizen of this nation. The Born In Malaysia Unity Exhibition is the first collaboration between Artemis Art and Kenny Loh, aimed at fostering a collective sense of belonging to Malaysia. Our combined effort, however, doesn’t end here. Two follow-up programs are in the works and will be announced during the official launch. This nation certainly has come a long way since achieving independence in 1957 and becoming Malaysia in 1963. While there already is national unity to a great extent, there continue to be challenges. Unity is something that needs to be embraced by all, continuously nurtured and not just officially promoted by the powers that be. Every individual has a role to play, and the Born In Malaysia Unity Exhibition is our modest contribution as a private initiative, towards the ideal of a national unity that continues to be strong, and one that becomes stronger in times to come, despite the many challenges that await us.